When a director sets out to turn a book into a movie, they have to make it their own. There is no way to take words on a page and translate them literally into images and sounds. Even if a filmmaker didn’t have to deal with the time constraints of a commercial feature and had the freedom to include every event, every episode described in a novel, there’s no way to replicate the experience of reading a book on the screen. They’re two different mediums, and to make a successful adaptation, you have to transform the book into a film. So I can’t really fault Francois Truffaut for not capturing the feeling of Ray Bradbury’s Fahrenheit 451 in the film he made of the novel. Bradbury’s work is so much about the experience of words, and the resonance that words have, there’s no way you could replicate what he does in a movie. But I still have to say that the film doesn’t work for me. I’ve never been able to connect with it. Which is not to say that it isn’t worth watching. In many ways I think the film is kind of brilliant. The world Truffaut creates and the visual language that he uses have a striking immediacy. While his earlier features were shot largely on location, Fahrenheit 451 was made in a studio. Truffaut uses this to his advantage by emphasizing the artificiality of the environment that Montag, the fireman, lives in. Art director Syd Cain (aided by Tony Walton, uncredited) gives an eerily bright, hard-edged look to this future society where TV controls all information and conformity is the key to survival. The brilliant reds and solid blacks of the fireman’s world contrast effectively with the earth tones of the natural landscapes and the homes inhabited by the book people. Cinematographer Nicolas Roeg takes full advantage of these extremes. He is amazingly sensitive to the various qualities of light, using it to define the stark, modern interior of the firehouse, and to paint the subtle, ghostly beauty of the English countryside. Working with editor Thom Noble, Truffaut finds a rhythm to suit each sequence. Jump cuts give urgency to a scene where a man is warned he’s about to be busted. The firemen’s raids crackle with a scary energy. Long, uninterrupted takes emphasize the arid, sterile atmosphere of a suburban home. But in spite of all that, I have to say I just don’t connect with the film on an emotional level. There’s something strangely detached about it. You might say that the movie’s polished, impersonal feel would be totally appropriate for this cold future world, but if we can’t connect with Montag as he struggles to break free, then there’s no dramatic impact. As creative as Truffaut and his team are in giving the film a look and a feel, for me the finished product is emotionally flat. Pauline Kael felt Truffaut’s approach was too restrained, and she may have a point. Fahrenheit 451 was one of Bradbury’s early novels, and it clearly comes out of his roots as a pulp writer. Apparently the book was the author’s response to the chilling oppression of the McCarthy era, and the theme of an individual struggling against a totalitarian government could hardly be stated more bluntly. Montag has to choose between good and evil. Truffaut may not have been comfortable with such a clear-cut moral choice, and he seems unwilling to play it to the melodramatic hilt. There is a reserve in his approach which makes the actors seem strangely distant. It’s also possible that, since this was his first film in English, the language was a barrier he couldn’t quite overcome. And it’s important to mention that the director’s relationship with Oskar Werner was strained during the making of the film, which may have affected the way Montag comes across, or doesn’t come across. Then again, a good deal of what makes the book memorable is the language, and that’s something you can’t put on screen. 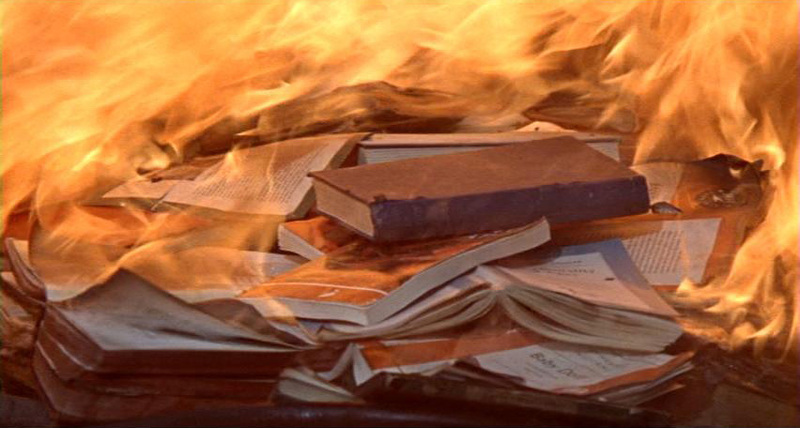 I started to re-read Fahrenheit 451 recently after watching the film. I have to say that the story does seem naive and melodramatic. I definitely feel like it’s the work of a young writer, and it doesn’t have the depth or the subtlety of the author’s later work. But the way he writes is totally compelling. Bradbury’s language is dense, rich, intoxicating. His prose is so close to poetry that the line between the two disappears. There’s poetry in Truffaut, too, but it’s a different kind. As a filmmaker he seemed to be seeking clarity, simplicity. Often his best films, such as The Wild Child and The Story of Adele H., have a brusque directness, a naked honesty that allows us to get very close, often uncomfortably close, to the characters. The poetry is held in check, never being allowed to overwhelm the story. Bradbury, on the other hand, wants to overwhelm the reader. He plunges us into his own sensual dimension, a world of experiences he describes so vividly we can touch them, taste them. While Truffaut’s sensibility is different from Bradbury’s, composer Bernard Herrmann is very much on the writer’s wavelength. His score has a rapturous intensity that is completely in tune with Bradbury’s world. Herrmann sets the tone with the first cue. As a narrator recites the credits over images of TV antennas, strings playing ethereal, shifting harmonies with no resolution, preparing us for the film’s chilling vision of the future. Immediately after we’re assaulted by the bracing, dissonant music that accompanies the firemen’s raids. Throughout the film, Herrmann’s eerie, otherworldly score keeps us off balance with its strange harmonies and unusual rhythms. It’s only at the very end, when we’re in the forest with the book people, snowflakes drifting from above, that the composer introduces a lovely, lilting melody, letting us know that Montag has finally found safety. The tension and anxiety that have dominated the score are gone, and the final, resounding chords reassure us that there is hope.